In retirement your Civic pension, your Canada Pension Plan (CPP) pension, your Old Age Security (OAS) pension and your personal savings will make up your retirement income. The Plan provides for a lifetime pension, payable monthly, based on a formula that takes into account your average salary and years of pensionable service in the Plan. This refers to the number of years, or partial years, for which you made contributions to the Plan. 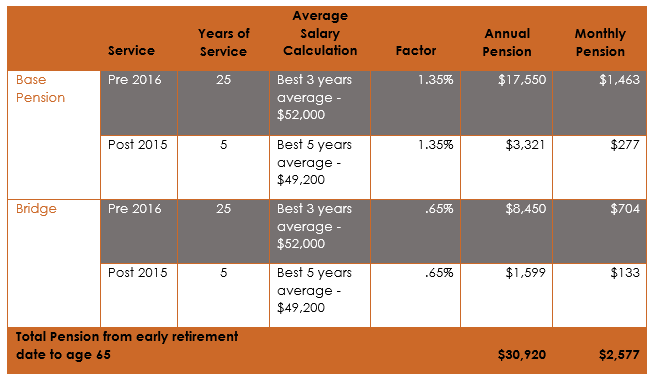 This part of the calculation is based on an average of your best consecutive years of salary. For service before 2016, a best-three-years average is used. For service after 2015, a best-five-years average is used. The Plan is designed such that members who spend most of their working lives contributing to the Plan can replace about 70% of pre-retirement income through a combination of Plan benefits and Canada Pension Plan and Old Age Security benefits. The bridge, and another feature called Integration take into account the fact that employees may wish to retire before they are eligible for Canada Pension Plan (CPP) and Old Age Security (OAS)benefits. From early retirement to age 65, this provides an annual income of $35,000 per year, which is 70% of $50,000. At age 65, the bridge benefit ends, but that income can typically be replaced through CPP and OAS. The Plan introduced significant changes effective January 1, 2016. As a result, your pension benefits could be based on two different sets of rules depending on when you earn your service. The Plan changed from a best three consecutive years average to a best five consecutive years’ average basis on January 1, 2016. The changes were implemented on a transitional basis, which means that a member who has service both pre- and post-January 1, 2016 will have two calculations to determine ‘average salary’. This change affects both the base pension and the bridge payment. At age 55, Allan has 30 years of service. 25 of those years were earned before January 1, 2016 and 5 were earned after that date. If you meet the requirements for unreduced early retirement, and retire prior to age 65, you will receive an extra benefit called a bridge benefit from the time you retire up to the end of the month in which you reach age 65. 0.65% of your average base salary per year of service. Your pension is protected against inflation through an annual cost of living adjustment (COLA). Effective January 1, 2016, the Plan introduced changes to the way cost of living adjustments are applied. The changes did not affect benefits earned up to the date of the change, but affect all benefits earned after that date. For all benefits earned after December 31, 2015, cost of living adjustments will be conditional on the Plan’s financial health and on the rate of return earned on the fund. For the portion of your pension benefits earned prior to January 1, 2016, your pension is protected against inflation through an annual cost of living adjustment (COLA). Your pension payments will be increased by 1/2 of any increase in the Consumer Price Index (Canada) year over year to a maximum of 4.25% in any one year. Please note that if there is a reduction in the Consumer Price Index (Canada) there will be no change to your payments (you will not receive an increase, however your payments will not be reduced).